Doesn’t everyone have a female friend of the family that they call aunt, but she really isn’t a blood relation? I had one. Aunt Honey. Honey was single, educated and well-traveled, and when I was a kid I thought she was so sophisticated and cool. She had been absolutely everywhere and she always smelled heavenly. I never knew what perfume she wore until after she passed away-it was Vol de Nuit Guerlain. One of my family members told me it was created for a pilot, which made sense. The beautiful bottle displays a whirling airplane propeller in relief. 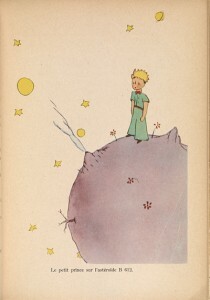 I never thought much about it until I started working at the National Air and Space Museum (NASM) Library and noticed that we had The Little Prince(PZ8. 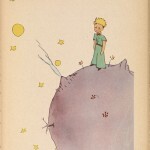 S14Li2X) by Antoine de Saint-Exupéry. I started doing a bit of research on the author and found out that, lo and behold, he was the pilot that inspired that heavenly scent Vol de Nuit Guerlain that my aunt wore. The perfume was created by the legendary Jacques Guerlain in 1933 two years after Antoine de Saint-Exupéry’s novel Night Flight (PQ2637.A274. V7 E1942), Vol de Nuit in French, was published. If you have ever had the pleasure of smelling the perfume I feel it so evokes the dreamy drama displayed so well in its namesake novel of the early airmail system in Argentina. The National Air and Space Museum(NASM) Library has quite a few books by Antoine de Saint-Exupéry to include Airman’s Odyssey (PQ2637. A274 A23), Pilote de Guerre (D788. S13),Flight to Arras (D788.S32X) and Wind, Sand and Stars (PQ2637. A274 T43X). The library also has a copy of the lovely book The Tale of the Rose: The Passion that Inspired The Little Prince (PQ2637. A274.Z82833513 2001X) by Consuelo de Saint-Exupéry, the widow of the aviator, and an artist and author in her own right. Sometimes synchronicity plays a bigger part in solving the mysteries of our lives than we may believe. Next Post What is an artist’s book?